Captured! Wonder Woman taking these two characters in for questioning! Knott's Berry Farm is notorious for it's scary themed evenings during Halloween but they bring it way down for the littler ones weekends during their Knott's Spooky Farm celebrations. Starting September 30th thru October 29 and Halloween day, It's all about the spirit of the season with this kid-inspired “spooky” celebration. Featuring activities for ages 3-11, including trick-or-treating, a live show, costume contest with the Peanuts gang, and a Dia De Los Muertos season of fun area you gotta get your kids to Knott's. The best part, it is all included with your season membership or general admission. Check out what's new and returning this year to the park! 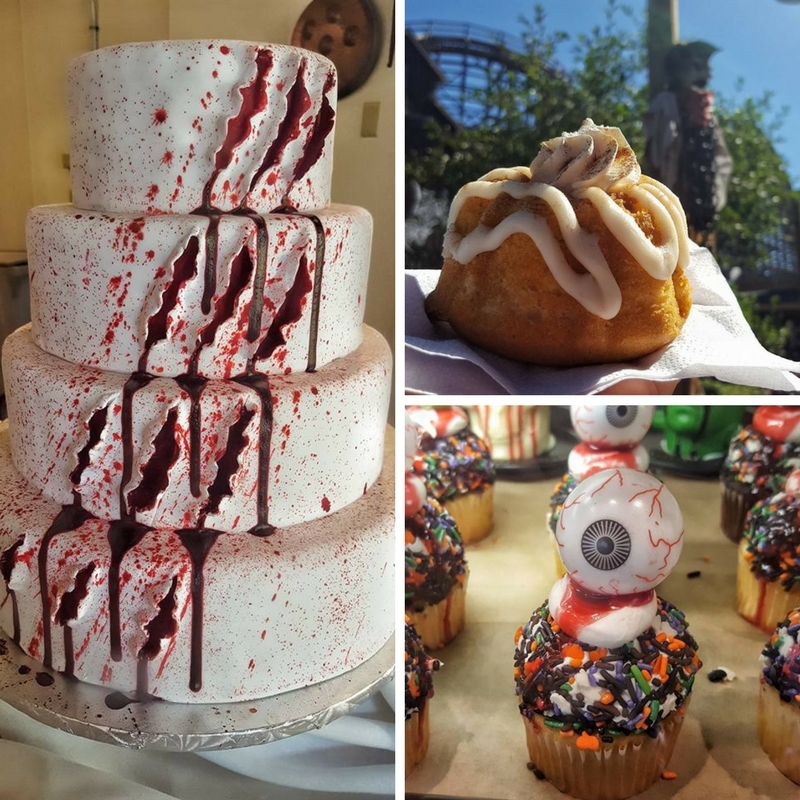 Something for everyone at Knott's Ghost Town Bakery. That cake tho, super fun and creepy! It's always a treat for us to visit Knott's, totally different than the other parks around with it's charming shops, shows and interesting characters roaming around. Even on a packed day it has a slower more laid back vibe to it. So what did we enjoy the most from this years event? Ghost Town! The characters there are so much fun to interact with in-between finding all the silly doorbells to ring and trick or treat at. The decorations alone had us stopping every few feet to get some great pictures, thankfully we got Fast Lane Passes to finish out everything we wanted to do with time to spare. Knott's tickets are beyond affordable, the best bang for your buck locally IMO, adding a Fast Lane Pass to your tickets ensures you have the ultimate experience at the park. Here are the top 7 things to do during Knott's Spooky Farm. Ghost Town Treat Stops: Grab your treat bag at the turnstiles and head over to Ghost Town for some treats and maybe even a few tricks from the friendly ghosts that are floating around town. While getting your treats and posing for a few not so spooky pictures be sure to try out the door bells, they are all different and make some silly sounds. Dia De Los Muertos: Head to Fiesta Village where your kids will learn about this traditional Latin holiday, shop the colorful mercado, enjoy a fun walk thru photo app area and even have their face painted (for a small fee). A Trip to Camp Snoopy: Ride the Grand Sierra and enjoy added 2D and 3D characters and effects with the entire peanuts gang of course! Creepy Critters of Calico: Stanley Scarecrow invites you (if you dare) to meet and get up close to some of his more creepier friends at the Liverly Stables in Ghost Town. NEW THIS YEAR Timber Mountain Log Ride: Halloween Hootenanny is a family friendly overlay to the classic ride open all day and night with even more fun and spooky surprises! Keep your eyes peeled for the Green Witch and the Calico Creeper band and don't be surprised if you get a little wet before the big drop. Livery friends come in all shapes and sizes. Be sure to dress the kids in their favorite costumes (bring comfortable shoes) and get down to the farm for this not so spooky Halloween event. The park is completely decorated making for a great day of family fun that will surely put you in a howling mood! Hours vary each day but range from 9-10 am till 5 pm weekends starting September 30th thru October 29 PLUS Halloween day. If you are planning on attending this years event I would suggest getting there early. There is so much to see and do along with all the rides and yummy food. Be sure to grab a park schedule so you don't miss any of the shows, know where all the fun activities are and grab a bag to go trick or treating if you didn't bring your own. This event is recommended for kids ages 3-11. Get your tickets and find out more below.